Posted On July 20, 2015 by Team iCynosure. Mumbai, the city of dreams is actually a city of harsh realities. It is the commercial, entertainment and financial capital of India but it is also the most populous city in the country. With a current population of 1.27 million people and an overall area of 4,355 km², Mumbai’s population density is 20,482 persons per square kilometre. Phew, that is really tiny. With so little space allocated to an individual, Mumbaikars are always running short of space for all their needs. The houses are becoming more compact with more people living together and thus space is becoming more and more constraint. And thus a concept like BoxMySpace is unique and perfect for the city, to help make space in your urban life. Established earlier this year by Pratyush Jalan, BoxMySpace was formed with just a single thought in mind; “To make space for the necessary and store away the rest”. BoxMySpace brings the same convenience of cloud storage to the physical environment to store away goods via a storage-demand service. The process is simple where a consumer reserves space for his things through the web or mobile application for a monthly fee starting at as low as Rs.99/-. The company delivers high-quality storage boxes to the designated address where consumers have to pack in all the things to store away which is then collected by the company for storage. Consumers are given access to the storage system to create a visual catalogue of all their stored items and a unique code to each item or box to enable recall within 12 to 24 hours. Larger spaces are also provided through four-by-four foot and six-by-six foot packages. So storage is made available in two forms ‘By The Box’ and ‘By The Space’ concept and consumers can pick what works best for them. 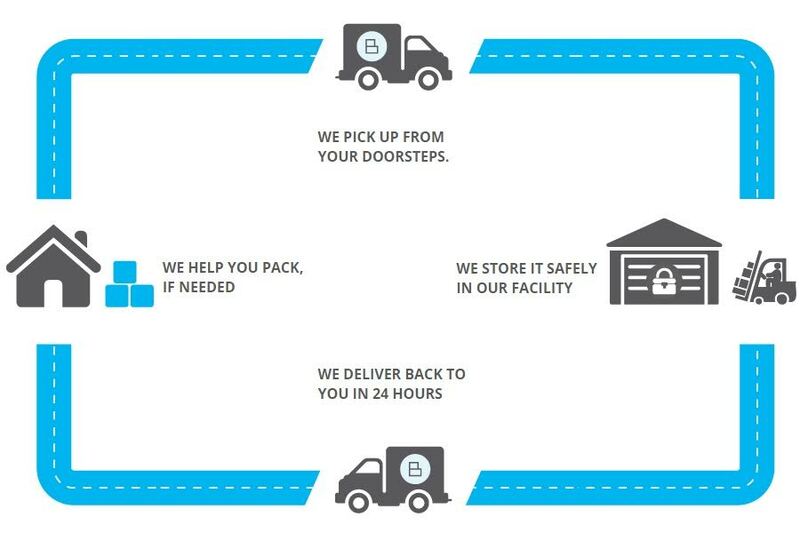 And when you want your stuff, simply log into your account, select the items you need and those will be delivered to you within 24-48 hours. This on-demand storage provider adds value to the quality of life by decluttering your space. Personally, as a mother and a professional, I think this would be so apt for me to store away a lot of things that my little princess no longer needs but I cannot give them away purely due to the memories that they bring. Looking around the house I see her pram, her crib and so many toys that can merit the benefit of this service. I think apart from home-makers who are always looking for that additional space to create magic at home, student and small-scale businesses would also benefit immensely from this concept. I remember when I was studying abroad every time I came home for a few days or went on a holiday I had to practically carry my whole world with me. But with a concept like BoxMySpace students can rent a box or two for a few months and store all their belongings there to do their bit of jet-setting. Even small businesses who do not have the funds to create large spaces for their business assets and material, can book a space and store away necessary things. While reading through more information on their site it also comes across as a convenient and secure option for working professionals to use it while moving or travelling to ensuring a smooth transit into a new place. This concept sounds amazing. Thanks for sharing in detail. this is really a great concept for lazy people like me who likes to keep things. i'm not as bad as being a hoarder, but still i'm capable of stocking up a lot of items! This is an interesting concept. I've never heard of BoxMySpace before. such an interesting service with innovative thought! Everyone need this in their life i guess!